West Shore Technologies, Inc. today announced a partnership with Five-Star Basketball. Both companies will unveil their partnership at Five-Star’s Coaches Party on Thursday, March 29, at the NCAA Final Four. The partnership will also include collaboration at Real Deal in the Rock in April, Hall of Fame Coaches Clinic in May and other recruiting events throughout the spring and summer. The partnership will enable college coaches using SportsBoardTM Basketball Scout, West Shore’s patent-pending iPad scouting and assessment application, to obtain player profile data that will then be pre-loaded in their iPads. 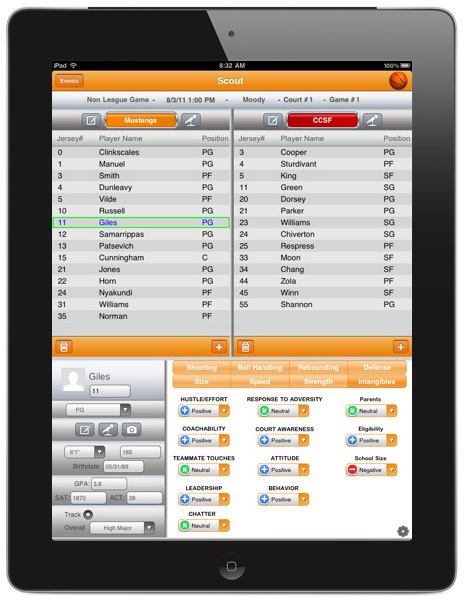 Basketball Scout replaces the bulky printed player packets and gives coaches the ability to enter ratings and textnotes, record voicememos, and take photos/footage for any player at these events on their iPads. “Five-Star wants to do anything feasible to help the sport and promoting Basketball Scout to the thousands of coaches we know will only raise everybody’s game in the sport,” said Shay Berry, who works with Klein and is also Hunter College Basketball’s coach and recruiting coordinator. Basketball Scout will allow coaches to easily search and find players in those hefty, cumbersome 300 page coaches packets, providing simple access for coaches ready to chart individual player shots or keep live stats on the in-game progress. SportsBoard Scout is also available for Soccer, Men’s Lacrosse, Women’s Lacrosse, Baseball, Volleyball, Field Hockey, and Rugby. For more information about West Shore Technologies, visit http://www.sportsboard-win.com. About West Shore Technologies, Inc.
West Shore Technologies is the enterprise software-as-a-service (SaaS) company that is optimizing scouting and assessment for collegiate, professional, high school and club-level lacrosse, basketball and soccer. By automating the clipboard via the iPad and then syncing assessment data from any number of coaches with servers in the cloud, coaches can spend more time analyzing players and making decisions and less time on the busy work required to input the data for analysis. SportsBoard facilitates better team rosters and more effective strategies and helps coaches achieve their ultimate goal: Winning! SportsBoardTM is a registered trademark of West Shore Technologies, Inc. in the United States and other countries.